On Launch Pad 17-A at Cape Canaveral Air Force Station, the first half of the fairing is moved into place around the Phoenix Mars Lander for installation for its planned August 2007 launch. A NASA spacecraftwielding a trench-digging robotic arm is poised for a Saturday launch towards thenorth pole of Mars to find out whether the icy region sports an environmentsuitable for microbial life. Thethree-legged PhoenixMars Lander is set to launch at 5:26:34 a.m. EDT (0926:34 GMT) atop a Delta2 rocket from the Cape Canaveral Air Force Station in Cape Canaveral, Florida. It?sdestination: the arctic martianplains of Vastitas Borealis. ?Is this ahabitable zone? This is really a major question for us,? said Peter Smith, thePhoenix mission?s principal investigator at the University of Arizona, during aThursday briefing. ?One that we hope to answer.? Observationsfrom spacecraft orbiting Mars have shown Phoenix's planned landing site to be rich in subsurface ice, atantalizing target for researchers tracking the history and role ofwater on the red planet. Phoenix is designed to use its robotic arm-mountedscoop to dig into and collect samples of Mars? surface, then scan them with ahost of onboard instruments. But reachingMars has historically been tough, particularly since the planet is rather unforgivingto small errors. More than half of all the missions sent to Mars have ended infailure. NASA?s ill-fated MarsPolar Lander, for example, suffered an apparent early shutdown of itsdescent rocket engines in 1999, likely sending the craft plummeting to itsdestruction on the martian surface. Phoenix carries many of the same instrumentsas its polar-bound predecessor in an effort to recoup some of that lostscience. ?It?schallenging, no doubt. Anytime you try to land on Mars, it?s a challenge,? saidDoug McCuistion, director of NASA?s Mars Exploration program. ?But the payoffis worth the risk.? The $420million Phoenix mission is expected to land on Mars on May 25, 2008 for aninitial 90-Martian day expedition. NASA?s Jet Propulsion Laboratory (JPL) inPasadena, California will manage the expedition. If successful,Phoenix?s Mars landing next year will be the first soft touchdown since NASA?sViking missions in the 1970s, mission managers said. Built byLockheed Martin, the 772-pound (350-kilogram) Phoenix lander is NASA?sfirst Mars Scout Program mission to explore the red planet with small,relatively low-cost robots. ?We?rethere to study the air, the dirt and the ice in this northern polar region,? saidLeslie Tamppari, NASA?s Phoenix project scientist at JPL, of the probe?smission. Much of thespacecraft and its seven instrument suites draw on equipment built for NASA?scanceled Mars Surveyor 2001 Lander and the lost Mars Polar Lander. ?Phoenixhad an inherent advantage in that it had a lot of inherited hardware,? said EdSedivy, Phoenix Spacecraft Program for Lockheed Martin, adding that the probehas undergone a barrage of tests to ensure it will work properly. ?It reallygave us a leg up in driving the risk down.? Folded awayaboard Phoenix is its eight-foot (2.4-meter) robotic arm, which carries acamera and instruments to study martian soil, as well as a spiked scoop strongenough to bite into ice as hard as concrete. Lining theprobe?s top, or deck, are more cameras, a wet chemistry laboratory, eight miniatureovens and other tools to determine the chemical makeup of Mars? ice and soilwith a special focus on the presence of organic compounds. Such complex compoundsand liquid water are thought to be among the requirements needed to supportprimitive life, Phoenix researchers said. Each tinyoven can only be used once and will cook just a pinch of martian soil -- about 30microliters -- and then analyze the leftovers. ?When theoven is heated?it gives off vapor just like cookie dough in your kitchen,? saidthe oven instrument?s lead scientist William Boyton, of the University ofArizona. ?And we use that to see what?s going on.? Phoenix isalso equipped to serve as the first polar weather station on Mars. The lander?sfour-foot (1.2-meter) meteorology mast gives the probe a total height of justover seven feet (2.2 meters) and carries a series of heat sensors to measureatmospheric temperature at different heights. A small cylinder tethered to thetop of the mast will indicate wind direction, Phoenix researchers said. A laserdetection and ranging (lidar) tool will beam light into the martian sky, thenmeasure the amount reflected back to track atmospheric particles and clouds. ?I?mexcited about finding Earth-like clouds at Mars,? Deborah Bass, NASA?s deputyPhoenix project scientist at JPL, told reporters Wednesday. While Marsresearchers are targeting a 90-Martian day mission for Phoenix, they don'texpect the lander to last as long as NASA's hardyrovers Spirit and Opportunity, which are currently hunkered down to weathera massive dust storm in their fourth year of an initial three-month mission. ?Oncewinter approaches, we will be immersed in solid carbon dioxide ice,? Smithsaid. ?It will certainly not survive that kind of winter.? 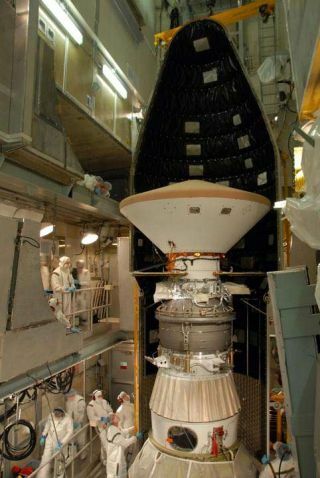 NASAwill broadcast the Phoenix Mars Lander?s launch live on NASA TV beginning atabout 3:30 a.m. EDT (0730 GMT).